The fifth annual Bedstock event is officially underway, and will feature over 80 artists performing from their beds to raise funds for hospitalized kids. Conceived in 2014, Bedstock was designed to raise money and awareness for children who spend most of their days confined to a hospital bed. The event is presented by MyMusicRX, the flagship program of the Children’s Cancer Association, and is the only online music festival in which artists perform from their beds. This year’s event will see “Weird Al,” Death Cab for Cutie, Hozier, and over 80 of their contemporaries play their respective hits via social media and Bedstock.com. In addition to a packed bill, which will also include Elle King and Wilco’s Jeff Tweedy, Bedstock will feature dozens of musical performances from bed-ridden children who have written their own original music. 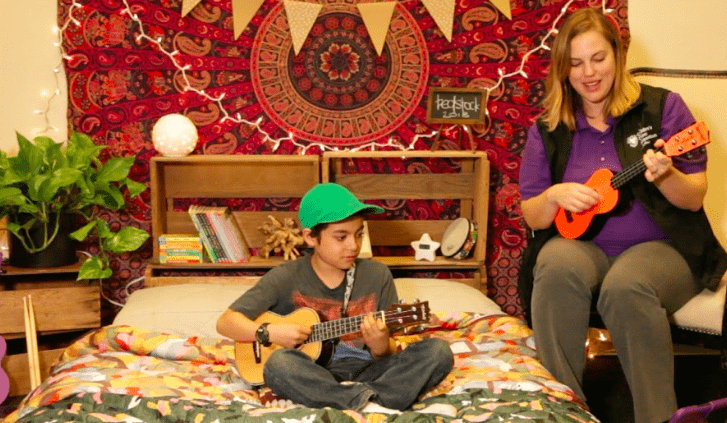 Bedstock creates a direct connection between the kids MyMusicRx serves and their favorite musicians. They literally perform next to national recording artists like Weird Al and Death Cab for Cutie at Bedstock.com, while also directly experiencing those artists’ support to uplift their journey through cancer or other serious illness. Guyer went on to tell me that fans are encouraged to send monetary donations for a chance to win a variety of prizes, including an Epiphone guitar signed by more than 40 Bedstock artists. This year’s event lasts for eight days, and will feature a record breaking number of kid-performances. While many of us see our bedrooms as a cozy place of refuge and rejuvenation, they can also represent a painful reminder to children who spend their days in bed. Guyer told me that events like Bedstock and organizations like MyMusicRX provide these kids with a much-needed sense of normalcy as they endeavor to mitigate the anxiety and sadness associated with serious illness. So, why did the CCA choose music instead of stand-up comedy or some similarly uplifting brand of performance? Well, according to Guyer, listening to music has proven to ease both emotional and physical stress in patients — and the CCA is searching for ways to regularly include music medicine into treatment. Even outside of Bedstock, music has been clinically shown to help regulate heart rate, lower blood pressure, ease digestion, and even extend restorative REM sleep. If you’re looking to benefit from the healing power of music, The National Sleep Foundation suggests listening to songs with a BPM of 60-80.